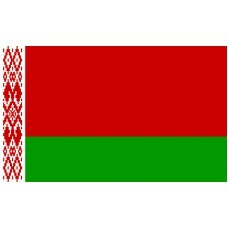 The National flag of Belarus is composed of two horizontal stripes: red over green, with the red stripe taking up twice the space of the green stripe. The left side of the flag features a red and white pattern running down the side. 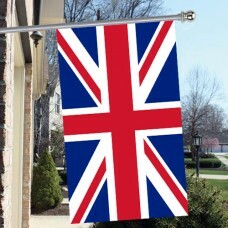 The flag was originally adopted with a thinner pattern than it has now on June 7th, 1995 following a national referendum in May of that year. Since February 10th, 2012 it has been replaced with a slightly thicker pattern. Independence from the Soviet Union on July 27th, 1990 had been a natural consequence of the break-up of the Soviet Union. The new flag remained similar to what it was in Soviet Union days except that the hammer and sickle symbols of communism were removed. The Soviet Union Flag with the hammer and sickle symbols had been established in 1951. 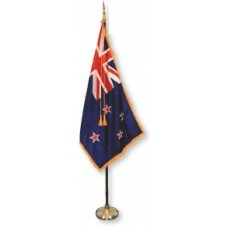 Before that the country had had a number of different flags. A totally red was used in 1919 when the Lithanian-Bellarusian SSRB was formed and three variations of it with the lettering ССРБ were implemented between 1919 and 1951. 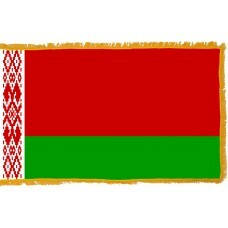 Before that the Belarus Flag had been a white flag with a red horizontal stripe in the middle of it. This was brought back in 1918 for a while and during the years 1991 to 1995. Belarus is a landlocked country just a little smaller than the size of the UK and flanked by Russia, the Ukraine, Poland, Lithuania and Latvia. The history of the Belarussians people began in the 6th to 8th centuries AD with the migration of the Slavic people throughout Eastern Europe. East Slavs settled in Russia, Ukraine and Belarus. Because of this, there is a strong similarity between the three languages, which all developed from the Ruthenian language during the 13th to 17th centuries and this had evolved from East Slavic over the 10th to 13th centuries. According to a 2009 study carried out by the Belarus government, only about 12% of the population speaks Bellarusian at home, with most of the rest of the population speaking Russian. Bellarusians had a difficult history through the 16th and 17th centuries with freedom of serfs being steadily reduced while taxation was increased. There was also a religious conflict, where the fundamentally Orthodox rulers wanted to impose Catholicism (which incidentally has very little doctrinal difference). The pressures on the poorer classes of society caused many of them to flee to remote areas. Later several events hit the people hard: The Communist revolution of 1917, World War II and finally the Chernobyl disaster. At the beginning of this millennium about a fifth of Belarus was still radioactively contaminated, and as a result, the country has suffered a very high incidence of cancer. Although the Soviet Union has formally ceased, Belarus continues to have strong trade and cultural ties with Russia. Glory to the brotherly union of people! Courageously defended our homes threshold.